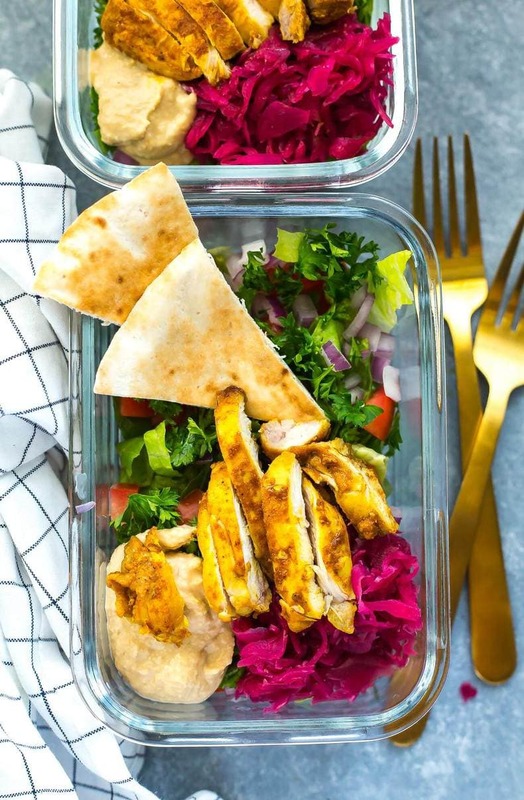 These Chicken Shawarma Meal Prep Bowls are delicious as lunches for the work week, and the shawarma marinade is just like your favourite takeout joint! Pair with parsley, hummus and pickled turnips for extra kick! 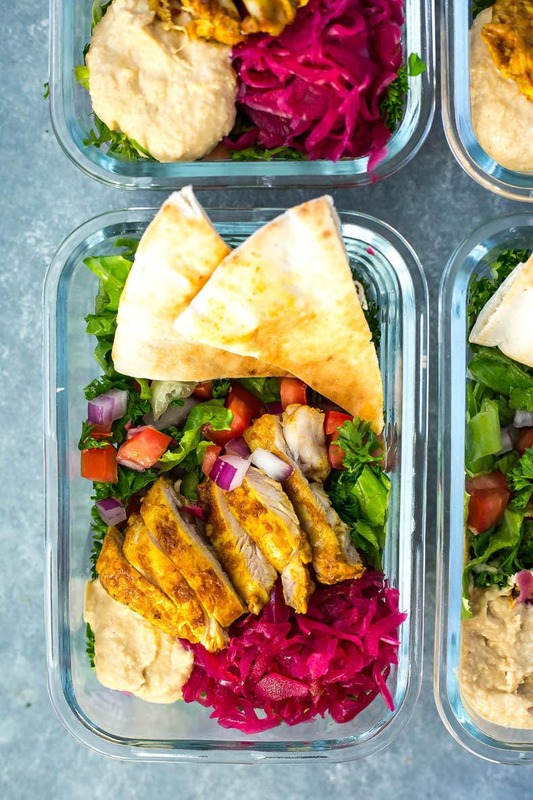 Say goodbye to takeout with these Chicken Shawarma Meal Prep Bowls! 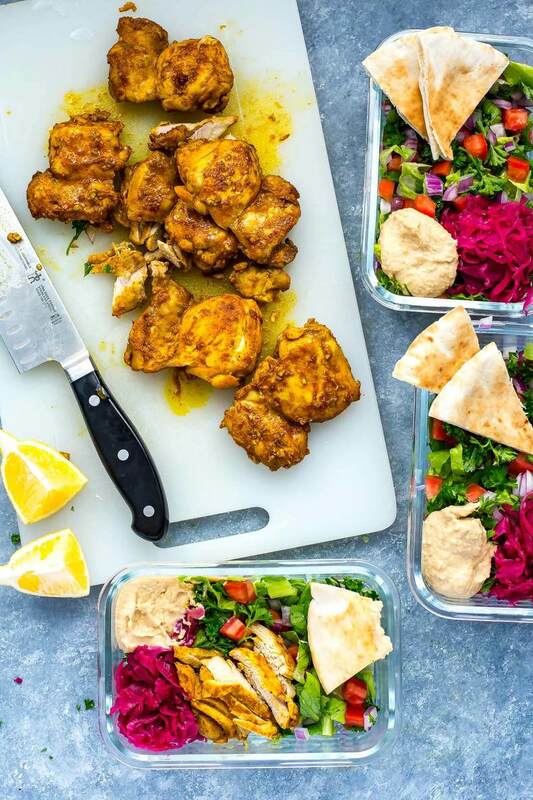 OMG, your favourite Mediterranean-style wrap now in a low-carb meal prep bowl (low carb if you leave out the pita bread that is). Is there anything better? *Drumroll please* HOMEMADE SHAWARMA-MARINATED CHICKEN!!! This is my very special chicken shawarma marinade and it is SO EASY. And made mostly with pantry staples too! No running to the store to make a super elaborate recipe, so please be patient with me when you see the long ingredient list below. I promise, it's not hard and mostly spices but the minced garlic and lemon juice are also key to getting the shawarma flavour. Nutmeg, cinnamon and cumin are probably the most key spices in the shawarma marinade so if you need to leave anything out, make sure you have these on hand at a minimum. I've made this chicken shawarma recipe so many times but only ever with boneless, skinless chicken breasts so this time I tried something different and used boneless, skinless thighs. Not only was the meat cheaper, it was also much more tender and gave off more of an authentic shawarma flavour. I think if I were to redo it again for a more elaborate dinner I would use a mix of breast and thigh meat, because that's because what the best shawarma is: a mix of dark and white meat. Or you could do like me and turn the shawarma into SHAWARMA FRIES OMG! From there, it's a just a matter of putting in your toppings! 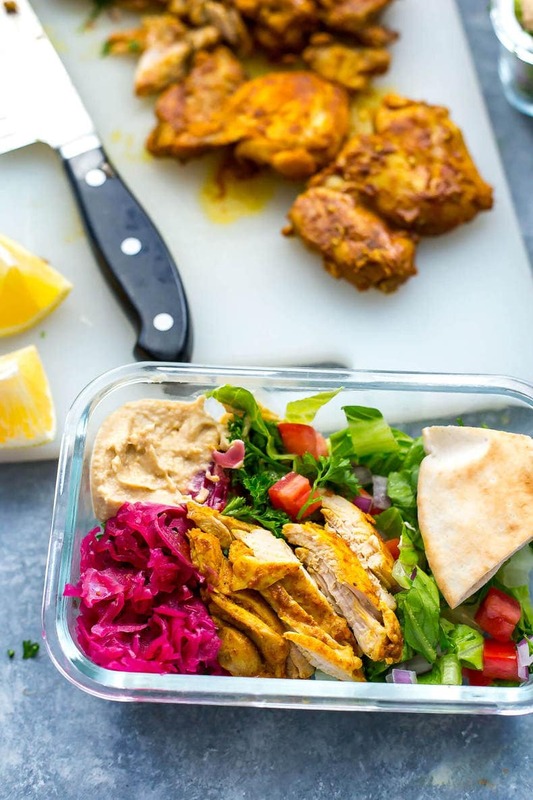 To make these Chicken Shawarma Meal Prep Bowls, you're going to definitely want to use pickled turnips or pickled red cabbage. That combined with the flavour of the shawarma marinade is what is going to tie these bowls all together. Knowing how difficult it can be to find pickled shawarma, I included pickled red cabbage in this recipe. I've had shawarma with both turnips and red cabbage and definitely prefer the turnip, but it's so hard to come by. We have an international foods store in Hamilton that sells jars of it in their deli section and I found some in a Loblaws in downtown Toronto (the Maple Leaf Gardens location if any fellow Torontonians are curious!) and that was in the pickles section, but again, they can be very hard to find so pickled red cabbage is the next best thing. Good news for you, I've seen it in most groceries stores I go to so you should be able to find some. You just need a little bit of zingy flavour to balance out the strong flavours in the shawarma. 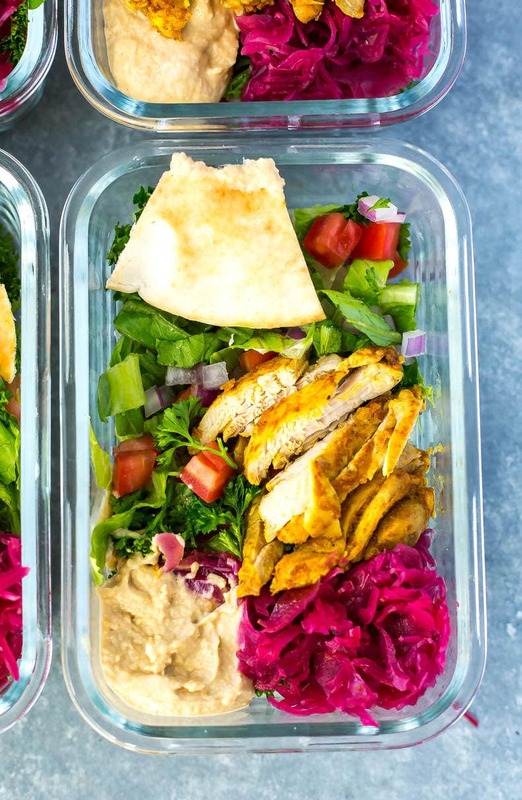 From there, it's a matter of hummus or garlic sauce (your choice, though hummus provides a bit more nutritional value and has less calories), pile on the veggies (parsley is key) and you've got yourself one heck of a week's worth of lunches!!! I tend to leave the pita out but I know it's nice to dip it in the hummus and such, so do as you please in regards to the carbs. 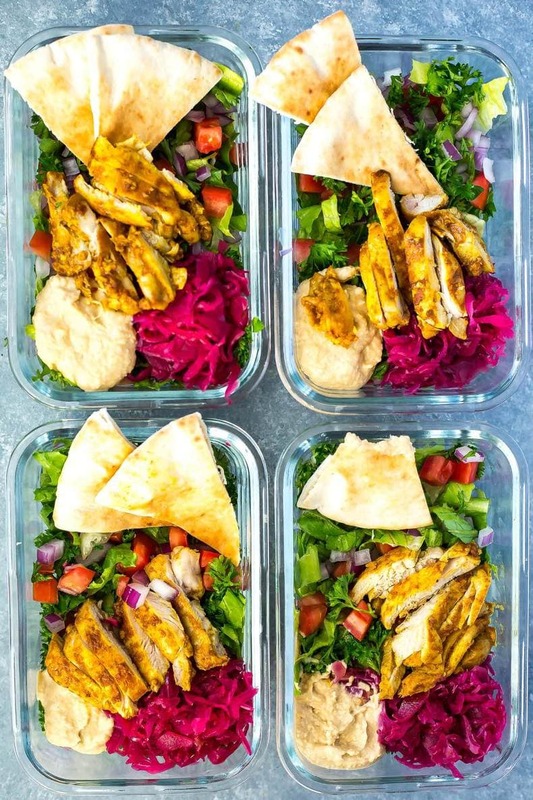 I usually skip it to shorten the ingredient list of these Chicken Shawarma Meal Prep Bowls but it's up to you! 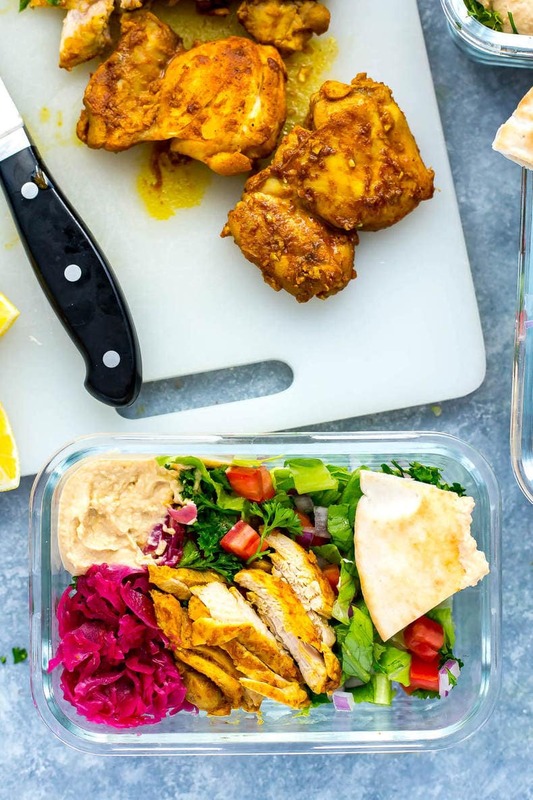 Will you be making these Chicken Shawarma Meal Prep Bowls? I promise you're going to end up the envy of the lunch room after you take these babies with you to work! I love switching up my weekly meal prep but I think shawarma is going to quickly become a staple in my diet after this! Preheat oven to 400 F. In a large bowl, mix shawarma marinade ingredients together, stirring well to combine. Add chicken and toss to coat, then marinate 10-15 minutes. Meanwhile, add lettuce, tomatoes, red onion, parsley, cabbage/turnips, hummus, lemon wedges and pitas to each bowl. In a large oven-safe skillet, heat a bit of olive oil over med-high heat. Add chicken and saute for 4 minutes each side, then place in oven and cook for another 10 minutes. 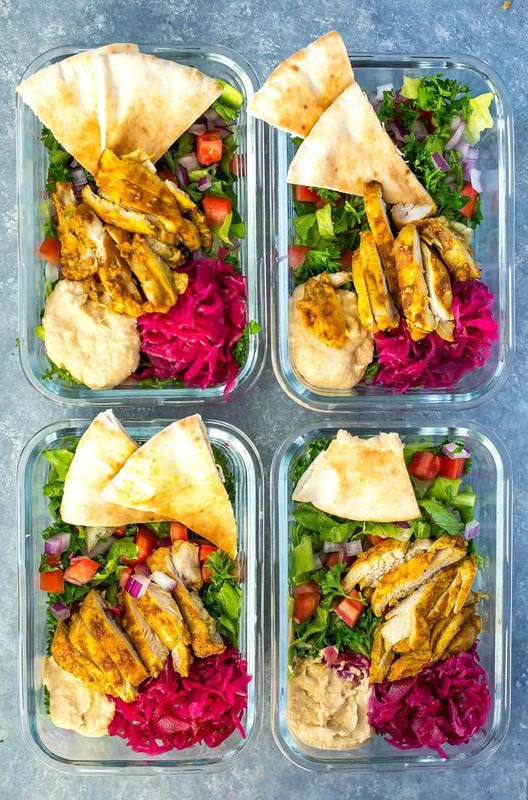 Slice chicken once cooled and divide among each meal prep bowl. 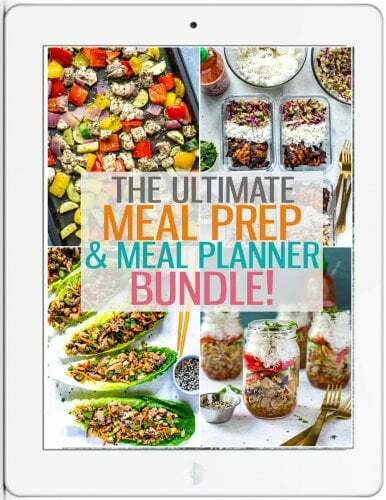 Eat all bowls within 5 days! 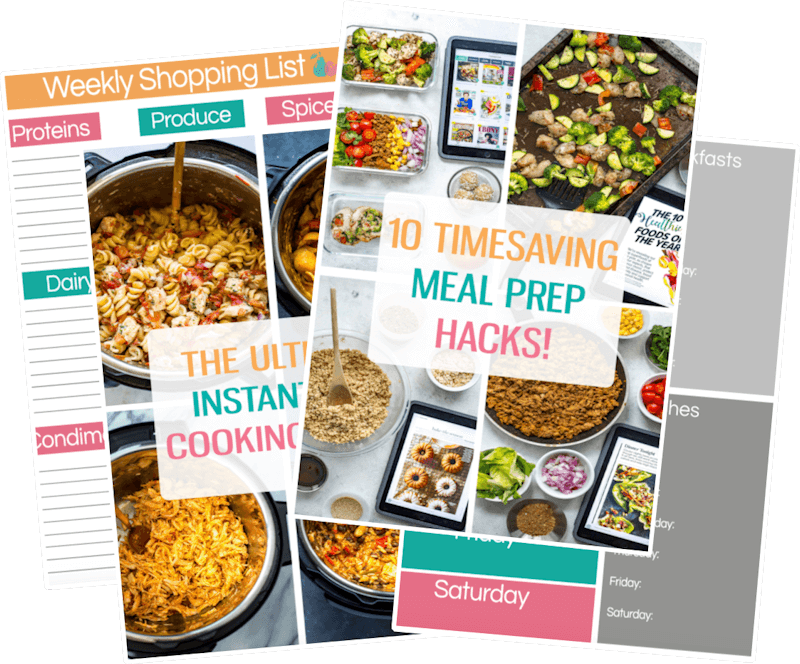 My husband and I are about to embark on a new diet — and the best way for me to stick to it, is to plan and prep the meals ahead — so I don’t have to think about it. Great option here! Where is a good place in Toronto to get good spices, like high quality spices ,esp for turmeric and cinnamon? What brands of spice do you use ? Hi Taylor! Greetings from Boston. 🙂 I am enjoying this dish for lunch at work–it’s delicious and so easy to make! I’m glad I discovered your blog and can’t wait to try out some of your other recipes. P.S. I tried subscribing to your blog, but haven’t gotten any emails. Do you have any suggestions? Thanks! Hey Kimberly – thank you so much for the kind words 🙂 Did you get an email asking you to confirm your email address? If you could give me more details maybe I can help troubleshoot! Turns out the emails had gone to my spam! So I fixed that. Thank you!